(Nanowerk News) Scientists have deciphered the three-dimensional structure of the human genome, paving the way for new insights into genomic function and expanding our understanding of how cellular DNA folds at scales that dwarf the double helix. Second, at a finer scale, the genome adopts an unusual organization known in mathematics as a "fractal." The specific architecture the scientists found, called a "fractal globule," enables the cell to pack DNA incredibly tightly — the information density in the nucleus is trillions of times higher than on a computer chip — while avoiding the knots and tangles that might interfere with the cell's ability to read its own genome. Moreover, the DNA can easily unfold and refold during gene activation, gene repression, and cell replication. 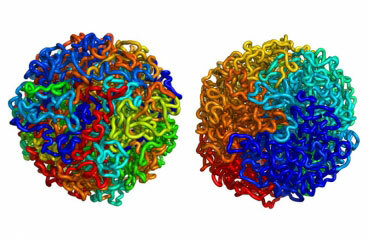 "Nature's devised a stunningly elegant solution to storing information — a super-dense, knot-free structure," says senior author Eric Lander, director of the Broad Institute, who is also professor of biology at MIT, and professor of systems biology at Harvard Medical School.